McAuliffe scholars develop habits of work and learning which help them become effective and successful middle school learners. What’s the relationship between HOWLs and Academic Mastery at McAuliffe? The last part of McAuliffe’s mission -- “develop the knowledge, skills, and attitudes to achieve those standards” -- articulates the value that we place on teaching habits of work and learning as much as academic content. During the course of the last four years, we have built an increasingly coherent system for teaching and tracking habits of work and learning with the purpose of supporting our scholars’ academic growth through the development of HOWLs. Scholars self-assess their HOWLs during student-led conferences and passages. McAuliffe scholars’ development of habits of work and learning are directly correlated with their academic success. Data from each of the classes at the end of the 2016-17 school year indicates that the stronger a scholar's habits of work and learning, the stronger his or her academic success. The scatterplots below showcases the three grade levels of 2017 scholars and the relationship between their HOWLs and Academics. The data points come from the last trimester of the school year. “Mean HOWL Score” is a quantity representing the total average of all HOWLs grades a scholar received for that trimester of reporting, across all courses. The “Mean Academic Score” is a quantity representing the total average of all long term learning target grades for all courses. The scatter plot and line of best fit illustrate that the stronger the HOWLs score, the stronger the academic score. To further explore the impact of developing HOWLs on scholars’ academic performance, we will dive into a subgroup of 46 Class of 2017 scholars who had the cohort’s lowest academic scores at the end of sixth grade (the 2014-15 school year). This table shows the HOWLs progress and academic progress that these scholars made from sixth to eighth grade. The color-coded columns showcase the positive or negative growth the scholar made in HOWLs and academics (measured by calculating the difference in sixth mean score and eighth mean score). The scatter plot to the left shows the relationship between the HOWLs growth and academic growth. Though there are clearly some outliers in the data, a positive correlation is shown between improved HOWLs and improved academics for this cohort of scholars. In particular, notice that 27 of the 46 academically struggling scholars showed positive growth in their HOWLs from sixth to eighth grade. Of these 27 scholars, 21 also made academic gains. Meanwhile, some scholars declined in their HOWLs; of these, some maintained level academic performance from sixth to eighth grade and some declined. Where the outliers emerge are the instances in which a scholar made positive gains in HOWLs and decreased in academic performance (see Scholars 13, 15, 22, and 23) as well as instances in which a scholar declined in HOWLs performance and improved in academic performance (see Scholars 37 and 42). As we continue to refine our HOWLs practices we will monitor the frequency of outliers and hope to see fewer of them. What this data illustrates for us is that guiding scholars to develop stronger habits of work and learning has value beyond the development of the habits; for the most part, positive HOWLs growth is correlated with gains in academic performance. The data also illustrates the need for us to monitor scholars who are not developing strong HOWLs, as these scholars are more likely to have lower academic performance. In fact, scholars already lower in their academic performance, who declined in their HOWLs performance also declined in their academic performance. We intend to use our HOWLs data to identify these at-risk scholars and ensure the provision of intervention. In 2016-17 we piloted a Lab intervention class that targeted study skills. The scholars placed in this lab had particularly low HOWLs scores. It is our aim to continue along this vein through the use of Tier 1 and Tier 2 interventions so that more scholars receive targeted supports in class and during intervention blocks to support their HOWLs and academic skill development. Note: For the growth analysis, we dove into the most recent graduating class (Class of 2017) because this group of scholars have been a part of our evolving practices pertaining to HOWLs instruction and assessment. Any previous cohort of scholars has data that we can look at, but the data is much less valid as any targeted professional work had not yet happened with our teachers or staff. With this in mind, it is important to note that even the Class of 2017 experienced the instruction and assessment of HOWLs in different ways and also with different HOWLs as our practices evolved from the 2014-15 school year through the 2016-17 school year. The next section of this claim tells the story of how our HOWLs work has evolved during this period of time. How has teaching and reporting on HOWLs evolved over time? In 2014-15 and 2015-16, teachers set daily HOWLs targets for Collaboration, Perseverance, Responsibility, and Respect. Scholars were assessed on those daily targets as well on school-wide supporting HOWLS targets. Our 2014-15 and 2015-16 progress reports illustrate the way HOWLs were assessed. To the right are three sample progress reports for one scholar, Kelsi, who was in sixth grade in 2014-15, seventh grade in 2015-16, and eighth grade in 2016-17. In the 2014-15 and 2015-16 school years, the long term HOWLs targets and the supporting HOWLs targets are identical for each habit and course. You’ll also see that in 2014-15 most courses assess each HOWL during that single trimester. A note about Kelsi: Kelsi is one of our scholars who started off with low HOWLs grades that improved over time. As her HOWLs grades improved, so did her academic grades. She started off as a scholar teachers were extremely concerned about in sixth grade and in the start of seventh grade; by eighth grade, teachers were noting her improvement versus concern for additional interventions and support! Though we were assessing HOWLs, we were were not teaching them robustly and needed to work on more strategic instruction of HOWLs. It was overzealous of us to think that we could effectively and authentically teach all four HOWLs in each course. You’ll see in the 2015-16 progress report that some courses do not assess all four HOWLs. This represents a shift toward intentionally teaching certain HOWLs versus teaching and assessing all four during each trimester. Respect, though a shared value at McAuliffe, was difficult to assess compared with the other HOWLs. In 2016-17 we built on our previous successes and made substantial gains in our quality of HOWLs instruction and reporting. First, we changed one of our HOWLs from Respect to Inquiry, to be more aligned with “performance-based” HOWLS (attributes we could more easily measure and therefore assess). Second, during professional development, we learned how to write strong supporting HOWLs targets contextualized to the academic targets and expeditions. We also integrated HOWLs into our backward planning. This sample 6th grade science target-assessment-planner illustrates how we integrated HOWLs into unit planning. You can also see in the sample 2016-17 progress report at right, that some HOWLs targets were clearly contextualized to the coursework in that class. The chart below shows sample HOWLs targets for a variety of courses. Notice that the targets are aligned with the HOWLs and contextualized to the subject matter and expedition. ELA: I can hold myself accountable to the Other Wes Moore book group expectations. Math:I can create a math interactive student notebook with attention to neatness, organization and accuracy. Science: I can use self-monitoring strategies to reflect on my progress. Adventure: I can contribute to a culture of safety and trust through my actions and thinking. Science: I can contribute to high-quality lab results by adhering to lab safety expectations, following experiment procedures, and gathering accurate data to incorporate into results. Social Studies: I can contribute to a high quality podcast. Geography: I can encounter new people and places like a social scientist. Math:I can utilize problem solving strategies to attack challenging word problems. ELA: I can give and receive feedback that is kind, specific, and helpful. Wellness: I can create a relevant fitness goal that is focused on my weaknesses. Over the course of the 2016-17 school year, teachers worked to create strong supporting HOWLs targets that articulated the HOWL that scholars would most need to master in order to succeed on each academic unit of study. Teachers also created well-aligned assessments and lessons that guided scholars toward success on the HOWLs target. Here are two examples of how HOWLs were integrated into curriculum during the 2016-17 school year. In 6th grade Science, as part of their fall expedition, Building Bridges from Me to We, scholars worked extensively to build effective collaboration skills. This was done through their Bridge Design Teams: groups of 3-4 scholars went through the engineering design process to design and build a model of a bridge. Scholars worked together in these group for 6-8 weeks, setting norms, developing criteria for what collaboration looks like, reflecting on their progress, getting feedback from their teachers, setting goals, and completing HOWLs-based performance assessments. The videos below include scholars reflecting on how they made the HOWLs target come alive through collaborative norm-setting and reflection. In this video, Cam starts off reading the HOWLs target for this class: “I can contribute to discussions with my peers while following agreed upon norms.” (Note: It is difficult to hear Cam read this because he is facing away from the camera!) 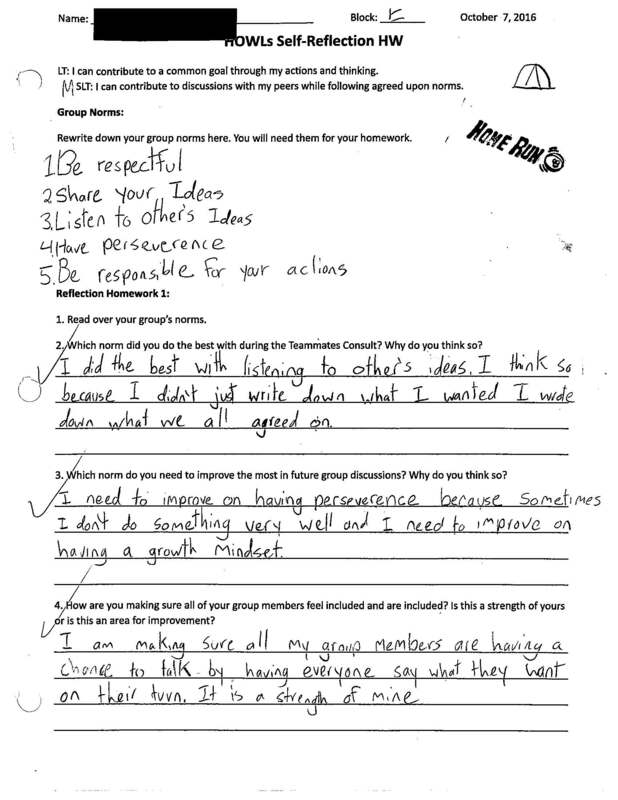 He then reflects on the process by which he and his classmates built the norms referenced in the target, and describes how ongoing attention to those norms has helped his group succeed on their bridge project. Here, a group of 6th grade scholars reflect on their progress on four attributes of collaboration that their class has identified: kind words, focusing, incorporating the ideas of others, and getting to 100% participation. The group notes their growth most of these areas, and agrees that they can continue to work on getting to 100% participation by striving to use their materials properly. This self-reflection references the norms this bridge group set and indicates this scholar’s thoughts about using the Teammates Consult discussion protocol. The scholar reflects on her strength at soliciting input from members of her group, an important element of collaboration. 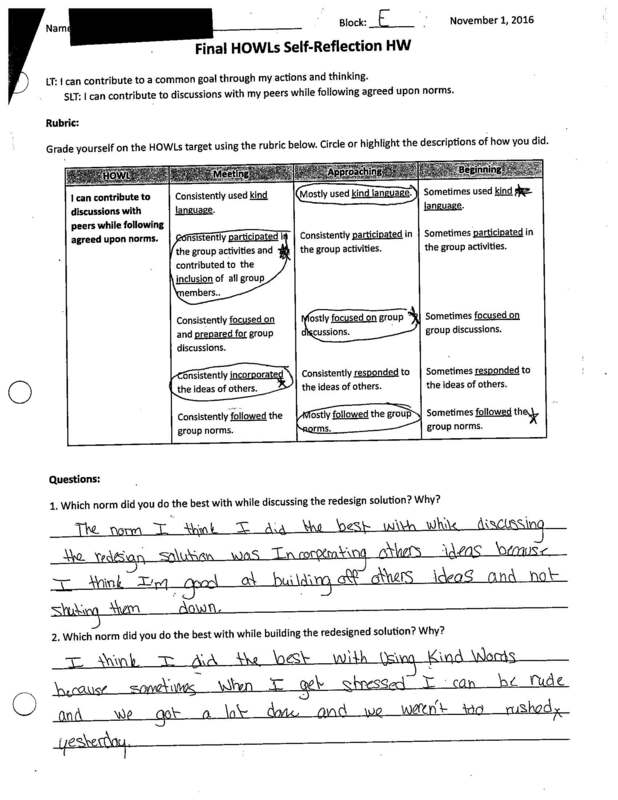 This self-reflection guides scholars to assess their group’s use of norms to assist them in a productive discussion. This scholar noted her success at giving kind feedback, especially because when she gets impatient, sometimes she can be rude! 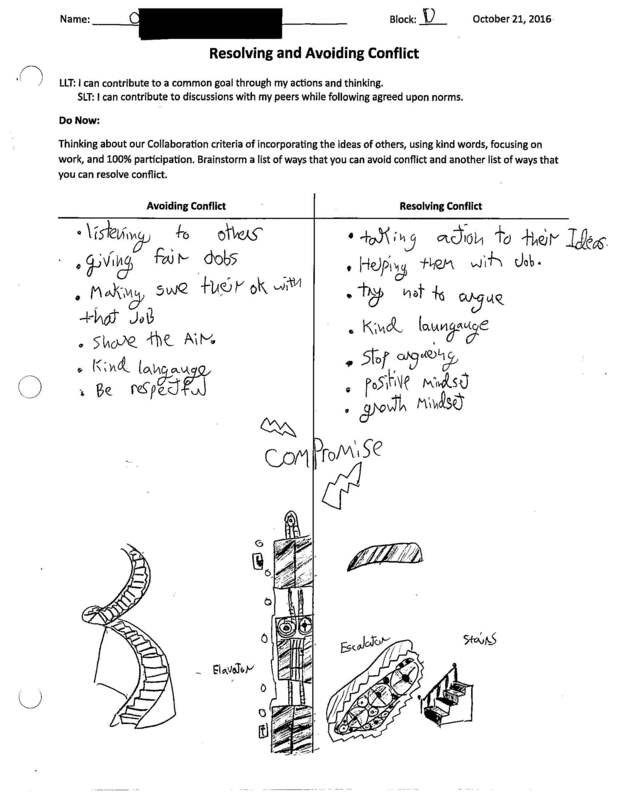 This Do Now activated scholars’ thinking about conflict resolution in the context of Collaboration. Scholars started by adding their own thoughts about specific ways to avoid and resolve conflicts and then added more ideas from peers during whole-group sharing. This next example of HOWLs integration into curriculum takes place in 7th grade humanities where scholars’ Interactive Student Notebooks (ISNs) are a critical tool for developing their habit of responsibility. 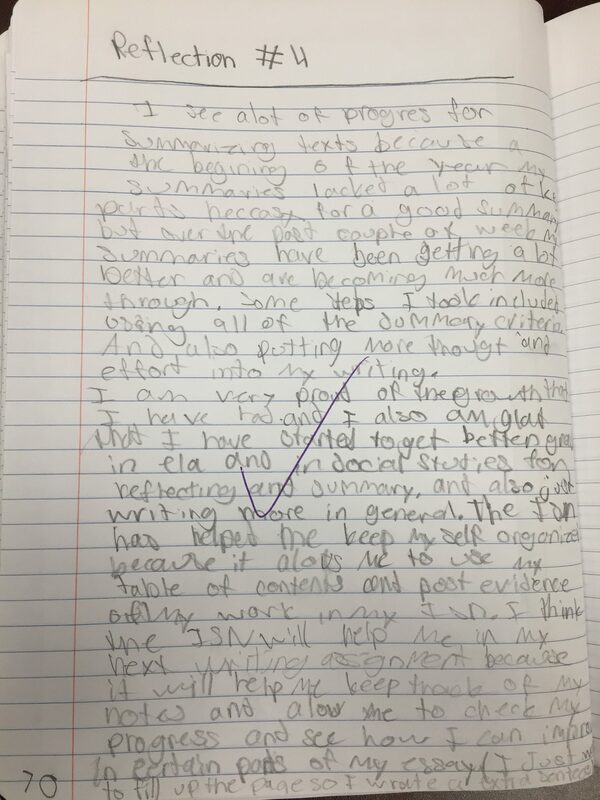 The HOWLS target was “I can use my ISN to reflect on my progress towards the targets.” This target named and required scholars to practice aspects of responsibility, including organizing materials, tracking learning, and reflecting on progress. Over the course of this unit, scholars learned to organize their materials, capture their thinking, and access the content for future assignments. Scholars received feedback about the content and organization of their notebooks, and they reflecedt on how they are using their notebooks and their progress on academic targets over time. 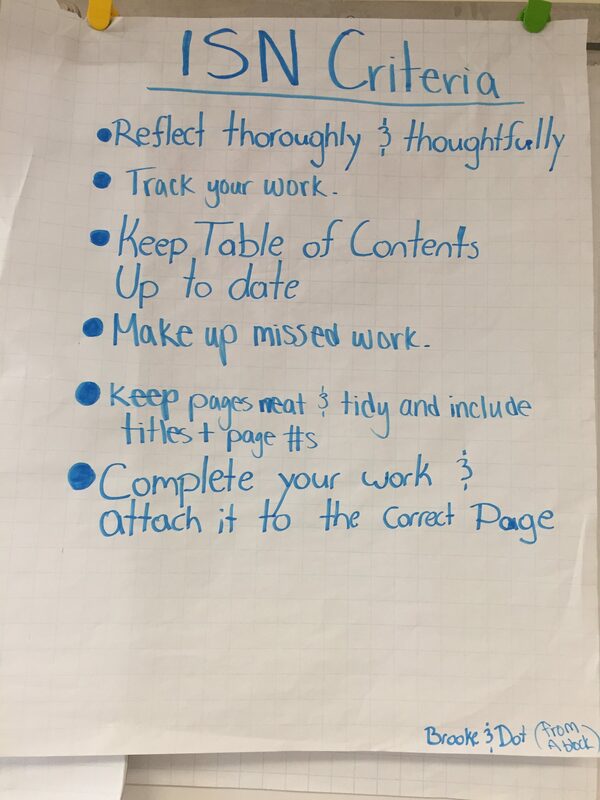 In order to develop and check their progress on responsibility, scholars created a criteria list for what makes a good notebook and for many of the types of content contained within their notebooks. See right for a sample ISN criteria anchor chart. This anchor chart remained posted in the classroom, reminding scholars of what they were striving for. Scholars also used this list when they reflected on on the use of their notebook. The sample pages below show a variety of types of reflections completed in the ISN, including reflection on using the ISN and reflections on progress toward meeting academic targets as evidenced by the ISN. 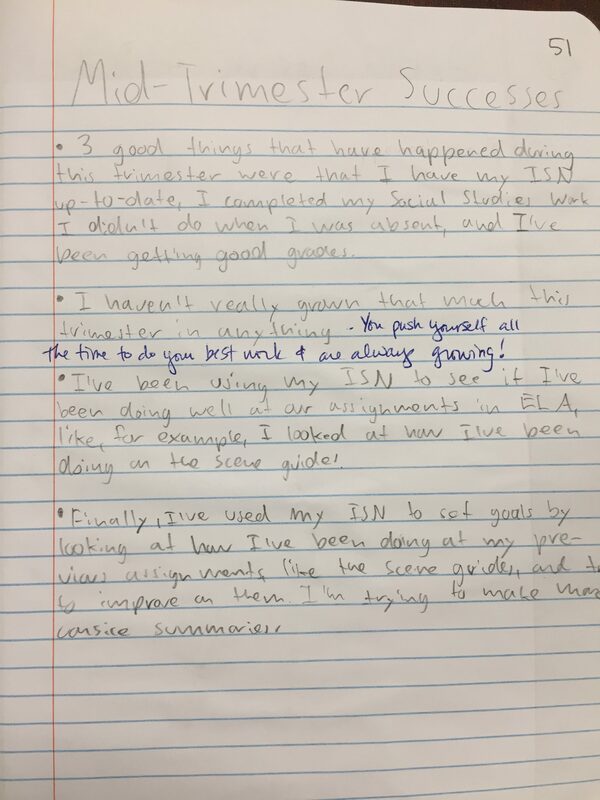 This scholar reflects on how he has been using his ISN “to see if I’ve been doing well at our assignments...for example, I looked at how I’ve been doing on the scene guide,” and “to set goals by looking at how I've been doing at my previous assignments.” This indicates that the scholar has been using the ISN to take responsibility for his learning. This scholar reflects on how her ISN shows how she has improved her skill at summarizing texts. She also reflects on what has helped her develop this skill: “Some steps I took included using all of the summary criteria and also putting more thought and effort into my writing. I am very proud of the growth that I have made and I also am glad that I have started to get better grades in ELA and social studies for reflecting and summary.” The scholar’s reflection indicates a strong relationship between developing the responsibility HOWL and her writing skills. This scholar reflects on her the progress she made toward the learning target “I can objectively summarize the text”. “On page 31 I got a [Beginning] but on page 56 I got a [Meeting]. 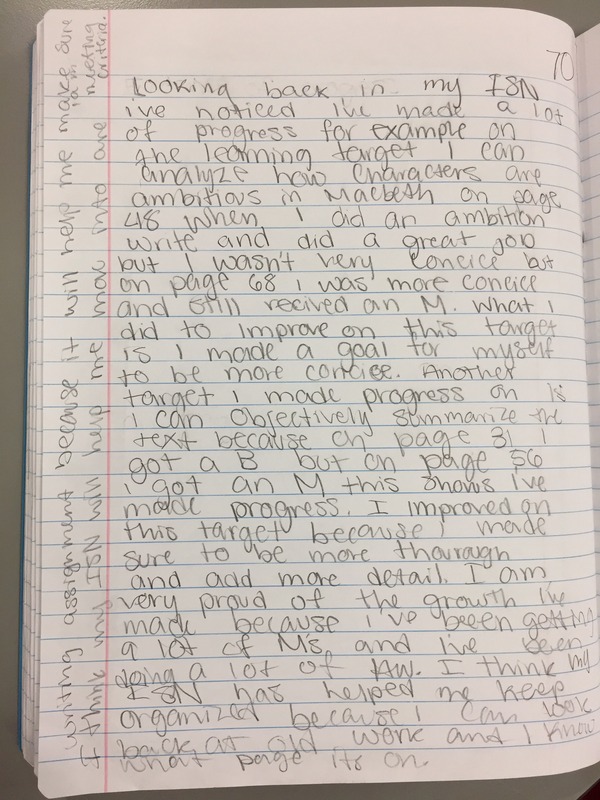 This shows I’ve made progress.” She also notes that “I think my ISN will help me move into one writing assignment because it will help me make sure I am meeting criteria.” This scholar also shows how developing her responsibility HOWL has direct impact on her academic mastery. In May 2017, we celebrated our growth with HOWLs instruction by completing a “Looking at Student Work” protocol. Teaching teams brought evidence of scholars progress on a HOWLs target as well as the teaching materials associated with the flow of lessons and assessments over time. All content areas showcased scholar learning and all had representative examples of HOWLs integrated into academic content. We are proud of the progress we made and thrilled with the way we have deepened scholars’ connection between HOWLs and academic performance. For the 2017-18 school year, our aim is for more HOWLs targets to be contextualized to coursework as HOWLs continue to be integrated into unit and expedition planning. We will also continue to improve the effectiveness of our HOWLs lessons and re-teaching. How do student-led conferences and passages support our scholars’ progress in HOWLs? Our McAuliffe scholars prepare for and facilitate two student-led conferences (SLCs) per year. As our instruction and assessment of HOWLs improves, scholars have increasingly reflected on HOWLs during their SLCs. These reflections not only show evidence of how far we have come in our HOWLs practices, but also are experiences that help scholars grow in their habits of scholarship. The video to the left shows several scholars reflecting on their HOWLs performance during their SLCs. For instance, Emma discusses the perseverance she needed to use in order to master knots in Adventure class, while Aracely reflects on her wish to improve her collaboration by allowing others in her group to speak more. By reflecting on the ways in which HOWLs have supported their learning, celebrating successes, and setting goals for future HOWLs improvement, scholars gain metacognitive understanding of the ways habits of work and learning help them grow as learners. In 2016-17 our eighth graders participated in a pilot of McAuliffe passage presentations. To highlight HOWLs, we chose to have scholars exclusively present on habits of work and learning during their culminating portfolio project. Each eighth grader chose a habit in which they felt a lot of progress had been made during their three years at McAuliffe. Scholars chose evidence that illustrated their progress and told the story of their journey at McAuliffe through the context of this HOWL. Scholars shared their passage presentations to their crew, a crew from 6th or 7th grade, to their parents/guardians, and other members of faculty. We found the first round of passages to be quite successful. Long time McAuliffe Special Education teacher Brittney Amanti said, “I was so impressed by scholars’ honest reflection about themselves, the growth they showed over their three years, and the way they were even able to acknowledge the bumps in the road along the way.” We will be using feedback from our pilot year to improve the passages process in 2017-18 by starting our 8th graders earlier on in the year, providing strong exemplars, and guiding improvements to the quality of the passage presentations. Using this SLC script, scholars are guided to reflect on the HOWL(s) in which they have been most successful, as well as the HOWL(s) they would like to work toward improving. In the video to the right Fiona gives her passage presentation, tracing her HOWLs successes and failures through the analogy of running for President. By reflecting on her HOWLs journey, Fiona was able to share her growth and use the self-knowledge she gained during her time at McAuliffe to set HOWLs goals for high school. For the 2017-18 school year, teachers are continuing to develop and refine HOWLs targets, lessons, and assessments so that they are aligned with our curriculum. We are also tracking scholars’ progress in HOWLs via our data dashboard (described in Mastery of Skills and Knowledge Claim 2.1). We will continue to improve and refine our system, in particular our methods for tracking scholars’ HOWLs development and using HOWLs data to inform instruction and intervention.